How to work from home like you mean it. How to code like a hacker. In one year. Via email. The lost art of becoming good at things, and a handful of reasons why you should have your own place on the web. 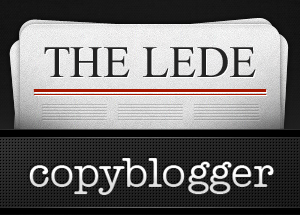 Follow @copyblogger on Twitter to grab these links (and more) every week. Yes, you’ve been seeing stuff on this “SOPA” thing everywhere. Yes, this link also appears at the bottom of this page. If you’re a content creator, it’s time to get on the bus, learn what SOPA is, and make your own decision regarding its importance or lack thereof. Ms. Simone has written an outstanding article that will help you do just that. It’s the dream of many — the “freedom” of working from home. For some, it becomes a nightmare of broken productivity, unconscious web surfing, and showerless days. Mr. Purdy offers some great insights into making the most of being a stay-at-home professional. The Lede makes an appearance in Neil Patel’s list, but that’s not why I linked it here. Link building is a foundational function of good SEO, and of therefore supporting your business on the web. Mr. Patel gives you real tactics you can put to use this morning, right after you finish reading The Lede. An incredible story of the use of email marketing to build a business. Email is so simple, and arguably the most powerful of all the social technology tools at our disposal. Are you building your email list? Watch this video and see how Tasting Table built theirs to one million subscribers in just a few years. Every small business is in the media business now. The media business is largely online. Even if you think you’ve got the best developer in Silicon Valley locked up tight for the next decade, it’s good for everyone to know the basics of how to code. Here’s how to get those basics down in a painless, easily understood series of lessons. Are you really good at something? Anything? Have you ever worried that maybe you’re spending too much time consuming and not enough time doing? In this Age of Distraction, what would happen if you decided to focus? Mr. Barr takes an intriguing look at what it means to get good. Some very good links indeed. Corbett’s article on “The Lost Art of Becoming Good at Things” strikes a particular nerve. It’s curious how George Leonard wrote in 1991 that modern education and employment seems designed to inhibit mastery. In the 20 years since, the situation has gotten far worse. I’ve been coding in a wide range of fields for about 15 years, but working through fundamental lessons such as provided by Code Academy are now fundamental stepping stones on my path to mastery. Even at the most basic level, I seem to extract new insight on a regular basis. I don’t play, but I suspect this is similar to why guitarists such as Yngvie practice arpeggios for hours and hours every week. In our little world, Gary Halbert advocated writing out converting sales letters, by hand, and copying working bullet points, by hand, over and over. Good advice. Boring. Effective. I haven’t had the privilege of reading any of these yet but I will definitely stop over and read them. Thank you for providing the links. “…an afternoon of self-loathing busywork.” Ouch. “How to work from home like you mean it”, informs perfectly and pulls no punches. Thanks for sharing this list rb. I read this article “5 Reasons Why Your Business Should Have a Blog” a few days ago and I think they are absolutely right. At this time when everything is going social and social media has more power than anything else, blogging just help a business to grow. I believe that every single business should represent itself with a unique tone that should be obvious at the first visit. And it doesn’t matter if the visitor comes to a blog or a social profile first. Just keep it fresh and honest. Oh Bruce. What would I do without you. Especially that Code Year link. Thanks man. Great links. Is the Lede, weekly? Definitely something to look forward to. Great list. I must say that Neil is an awesome guy to follow. Ive been reading his blog at quicksprout for over a year. Maybe that’s because we are both from Seattle 😉 , but he’s got some great insights on business and working hard for yourself.